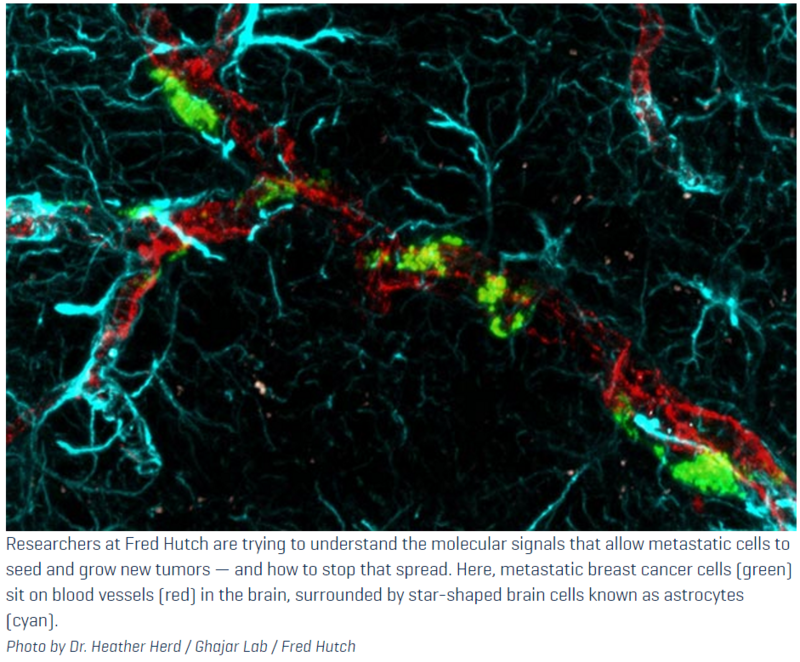 Metastatic breast cancer cells (green) sit on blood vessels (red) in the brain, surrounded by star-shaped nervous cells known as astrocytes (cyan). Researchers at Fred Hutch are trying to understand the molecular signals that allow metastatic cells to seed and grow new tumors ― and how to stop that spread. Here, metastatic breast cancer cells (green) sit on blood vessels (red) in the brain, surrounded by star-shaped brain cells known as astrocytes (cyan). Editor’s note: This is the second in a two-part series on metastasis. Read part one, about patients living with metastatic breast cancer, here. In some ways, cancer is maddeningly uniform. Different cells in a tumor aren’t all identical, but in a general sense, they are driven by the same, unifying goal: grow and divide, grow and divide, grow and divide. But one day, after enough growing and dividing, a tiny minority of those cells bucks the trend and does something different. Metastasis, or cancer spread, is complex and still largely mysterious. Those maverick cells have to go through myriad changes as they traverse the path from their original home in the primary tumor to new tumors they seed and form throughout the body. They change from stationary to mobile, actively pushing their way out of their tumor home. They breach the walls of blood vessels or lymph nodes. They survive the strange new environment and physical forces of the circulatory system. And at their final destination, they do all these steps again in reverse, setting up shop anew and triggering the growth of a metastatic tumor. Metastasis is very inefficient. Some large tumors may shed upward of a million cells into the bloodstream every day, but only a few of these cells actually form new metastatic tumors. If it weren’t so deadly the feat of those few cells would be almost awe-inspiring ― nearly all deaths from solid tumor cancers are due to metastatic disease, according to the American Cancer Society. Even so, there’s still a ton researchers don’t understand about the process, let alone how to stop it, said Fred Hutchinson Cancer Research Center postdoctoral fellow Dr. Minna Roh-Johnson, who studies the biology of melanoma metastasis. Fred Hutch basic researcher Dr. Jonathan Cooper studies cell movement ― a key characteristic of metastatic cells. In the first stage of metastasis, tumor cells make the transition from immobile to mobile, “walking” their way out of the primary tumor and through the tumor’s tough surroundings. Changing from static to mobile is yet another way that cancer cells are different from typical adult cells, said Fred Hutch basic scientist Dr. Jonathan Cooper, who studies the molecules that drive cell movement. While embryonic development involves “mass movements of cells,” Cooper said, most of our cells after we’re born stay where they are, with a few minor exceptions. You could think of cancer cells like tiny Benjamin Buttons ― they revert back to younger versions of their adult selves. 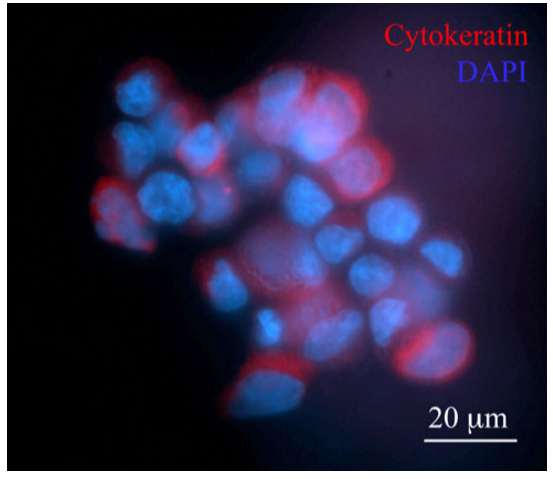 Cancer co-opts typically juvenile or fetal genes for many aspects of its biology, including migration, rapid growth and how specialized ― or “differentiated” ― they are.“In a way, just as the cells go back to an earlier developmental stage in terms of their differentiation state, so they go back to an earlier stage in terms of their ability to move,” Cooper said. Cooper and his research team study how breast cells migrate in the lab, pushing their way across the plastic surfaces of petri dishes. 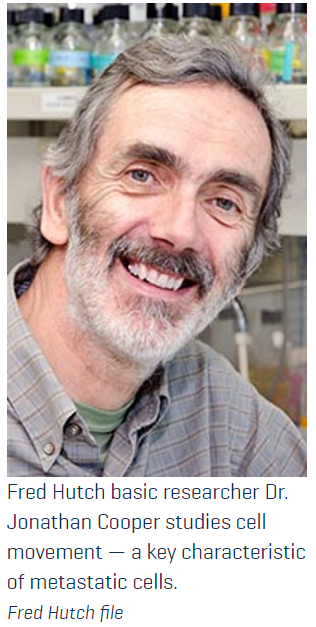 His lab is interested in the intrinsic properties of cells that trigger them to move ― or to stay still. They’re looking at certain genes involved in cancer growth, or oncogenes, and asking whether changing the activity of those genes speeds or slows the cells’ path across the lab dishes. But there’s more to metastasis than the cancerous cell itself. Its neighbors matter too. Roh-Johnson also studies cancerous cells’ shift from immobility to movement, but she’s interested in cancer’s surroundings, the “tumor microenvironment.” Working in the laboratory team of Fred Hutch development biologist Dr. Cecilia Moens, Roh-Johnson has established a system to study melanoma in real-time in the see-through zebrafish ― to see how healthy cells and tumor cells interact as metastasis begins. Fred Hutch postdoctoral research fellow Dr. Minna Roh-Johnson studies the early steps in melanoma metastasis. “It’s really only when you’re in your native environment that you can understand these complex interactions,” she said. In turns out that certain immune cells known as tumor-associated macrophages promote many steps of metastasis, including the earliest ones, Roh-Johnson said. She’s hoping to find the genes involved in this interaction ― with the goal of finding new treatment avenues to block macrophages’ pro-tumor functions while leaving their helpful functions unharmed. Once the metastatic cells gain mobility, they push their way out of their native tumor and through other layers of tough cells and molecules until they reach a blood vessel or the lymph system. Here, too, cancer hijacks healthy cells to help do its dirty work. Tumor-associated macrophages come along for the ride, as do other normal cells. Some of these cells secrete special proteins that help dissolve the tumor’s tough outer membrane and the sticky, fibrous collection of molecules known as the extracellular matrix surrounding both tumors and healthy organs, allowing the cancer cells easy passage on their march toward blood vessels. Once the tumor cells meet the boundaries of blood vessels, they can wiggle their way through the tight junctions between the cells that make up those vessel walls or ― and here’s where it starts getting really weird ― traveling tumor cells can actually pass directly through the middle of blood vessel cells, without harming those cells. Once the tumor cells are inside blood vessels, they’re on a timeline, said Fred Hutch breast cancer metastasis researcher Dr. Cyrus Ghajar. Some cells ― like immune cells ― are built to withstand the circulatory system’s physical forces. But for a cell born in a stationary environment, like a tumor cell, the blood’s dizzying 3 to 4 mph speed is stressful. Recent research from Dr. Kevin Cheung, also a breast cancer metastasis researcher at the Hutch, has found that breast cancer metastatic cells stick together and travel in clumps, like “a gang of thugs.” From the beginning to the end of their journey through the body, cells that stick together seem to survive better than apart, Cheung and his colleagues found. And the clusters can actually make themselves thinner to squeeze through tight capillaries. (For more on Cheung’s research, see Wednesday’s Hutch News story “I feel like this is the year.”) But together or alone, the tumor cells can’t survive indefinitely in the bloodstream. So they have to look for a way to get out. Breast cancer metastasis researcher Dr. Cyrus Ghajar studies how metastatic tumor cells remain dormant in the body ― and what wakes them up. Ghajar’s research has shown that the outer edge of the blood vessel seems to be a special kind of oasis for traveling tumor cells. If they can make it out of the blood in less than three days and remain right next to the vessel wall, they’re protected. These circulatory river banks protect the tumor cells from destruction by the immune system, but they also protect the patient ― to a point. The tumor cells stay “dormant,” or asleep and undividing, in those special sanctuaries. Ghajar and his research team have identified molecules in some metastatic areas (the lung and bone marrow) that contribute to that dormancy, with the ultimate hope of manipulating that natural system to keep metastatic cells from ever waking up. As for where the cells settle, it’s clear that metastatic tumors trend toward certain parts of the body �C such as the bones, liver, lungs or brain ― but it’s not completely clear why. In some cases, cancer cells seem to spread indiscriminately throughout the body, but conditions aren’t favorable for new tumor growth in most organs, so they remain dormant or die. But recent research from scientists at Cornell University and others (including Ghajar) has found that tumors can also prime certain areas of the body for metastasis before the cells ever reach it, sending out molecular packages that home specifically to other organs and render them a more fertile ground for metastatic cells. It’s not clear why some metastatic cells stay dormant for so long while others wake up relatively soon after spreading. About one in five metastatic breast cancer patients won’t get metastases until 10 years after they’ve been treated, Ghajar said. During his postdoctoral fellowship with breast cancer researcher Dr. Mina Bissell of the University of California, Berkeley, Ghajar found that when blood vessels change their structure, the metastatic cells sitting in dormancy near those vessels shake off their stupor and start to divide. And once those cells wake up, they are often much more resistant to chemotherapy than the original tumor ― one of the reasons metastasis is so deadly. Ghajar’s research team is studying what the cells do during dormancy, what wakes them up and why they’re so much stronger in the face of conventional treatments once they reawaken. Here, too, the neighborhood matters. Ghajar and his team have found that the area right around the blood vessels, besides keeping cells asleep, also confers therapeutic resistance. They want to pinpoint the specific molecules involved and eventually interrupt those molecules with a new kind of metastasis-preventing chemo that breast cancer patients could receive during their initial treatment. “Why not find a way to make chemotherapy that someone’s already going to get far more effective? We want to prevent them from looking over their shoulder in five or 10 years, wondering if the cancer’s going to come back,” Ghajar said. Postscript: Can metastasis be stopped before it starts? Metastasis has a dirty little secret. Sometimes, metastatic cells are seeded throughout the body before a patient’s primary tumor is even diagnosed. Up to 5 percent of patients with metastatic cancer have what’s known as an unknown primary, meaning their doctors can’t figure out where the cancer started ― the primary tumor wasn’t detected before it started spreading. This phenomenon points to the importance of screening and early detection, but metastasis can begin even when the primary tumor is not yet detectable. Researchers have seen that the cells shed from these tiny tumors are better at spreading and seeding new metastatic tumors. Ghajar believes that new therapies to prevent or treat metastasis need to focus on the biology of those early spreaders. By the time a primary tumor is detected, it may look very different, genetically speaking, from any metastatic cells released from that tumor earlier in its lifetime ― and which now may be lying dormant throughout the patient’s body. For Ghajar and his colleagues working on new therapeutic avenues, this (even more) depressing side of metastasis means that they may have the best chance of helping the most people with metastatic cancer by focusing on stopping the later steps of the process.